I am sorry that I have been so slow in mass distributing pictures. I (meaning Errol) still don’t have a USB cable for my camera. The pictures herein are pictures that Kate took. I thank her for sending them to me. He was under the lights for about 36 hours. 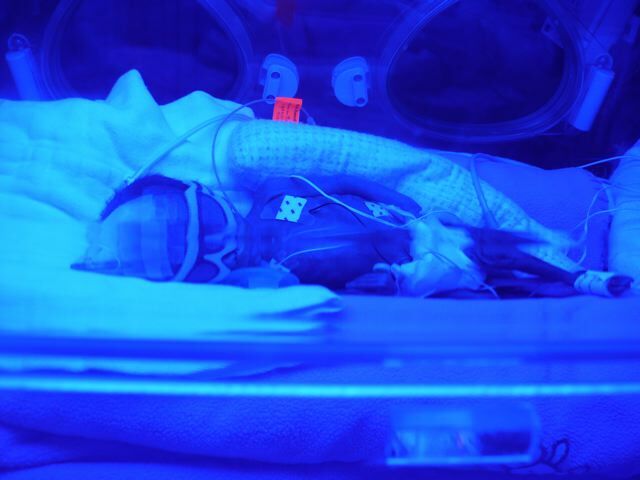 This morning his bilirubin went down enough for them to take him out from under the lights. 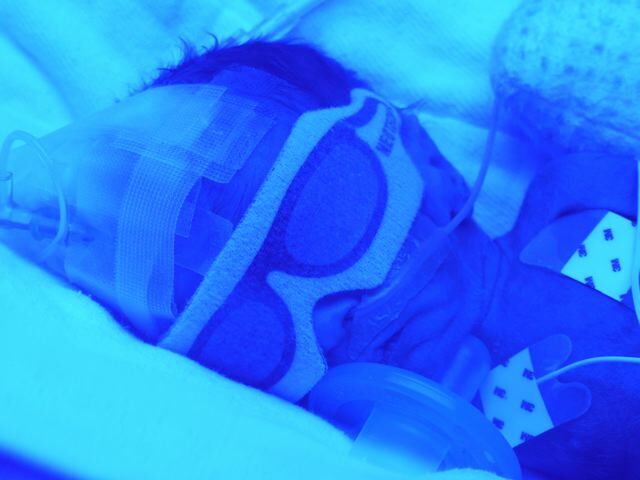 There is little chance that the jaundice will come back. All in all, Thom is doing great. Now on to Anne. She is also doing great. She worked really hard on her recovery, and the work is paying off. She pushed herself to walk when the pain was really bad. This sped up her recovery significantly. Her pressures continue to be elevated, but not too significantly. Other than her high pressures, she is asymptomatic. Because of this, she was discharged from the hospital today (Saturday). She spent 33 consecutive days in the hospital. Needless to say, she is happy to not be a patient anymore. That said, she continues to sleep at Scottsdale Shea. The hospital managed to get us a room on the pediatric floor of the hospital. We are allowed to stay there for free while Thom is in the NICU. That is really nice. Anne still suffers from quite a bit of pain from walking, and she is easily fatigued. Both will get better each day. It is amazing how much better she is doing in three days. Those are all the words I can muster. Here are some more pictures. When we last left off in our hospital drama, Anne was waiting for her health to deteriorate. That began last Thursday. Her labs started to get worse ( i.e. her liver enzymes were elevated and her platelet count started to decrease). Her pressures also started to go up. Things stabilized a bit over the weekend, and we figured maybe a week more or so. This morning we had another growth ultrasound (they can only do them every three weeks because the ultrasound has a two week margin of error). If the baby made interval growth ( i.e. if the baby had three weeks of growth in three weeks) then we were going to stay pregnant for a bit longer. Unfortunately, the ultrasound indicated that the baby had not gotten any bigger! That was the main decision making factor–along with the fact that her pressures were very high the last 12 hours. Also, the blood flow in the umbilical cord was getting worse. So, around 9.00 am this morning we found out that we were having the c-section at 12.30. When they got her spinal in, the baby’s heart rate dropped a bit. Thus, they took the baby out really quickly. He is very tiny. 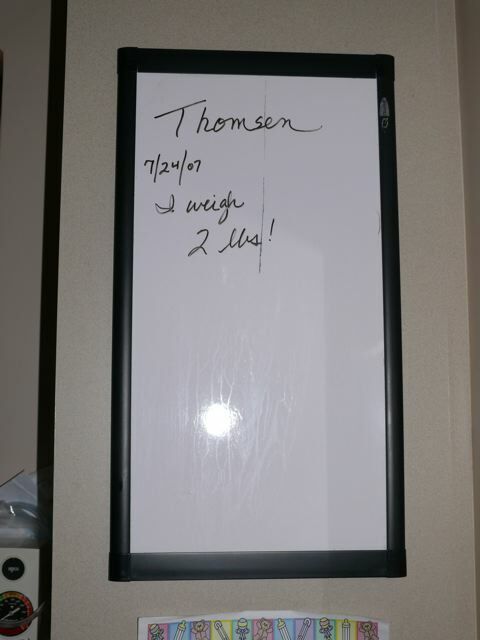 His birth weight was only 2 pounds! He was 14 3/4 inches long. His name is Thomsen Fitzgerald Lord. Although his weight is really low–that of about a 27 week old–he is acting very mature. He has been breathing on his own the whole time. He has also been crying and moving around a lot. That is all really good. 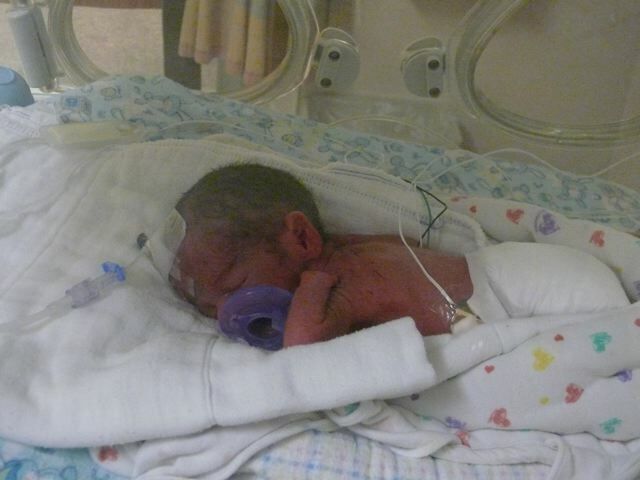 He will be in the NICU for 6-12 weeks. The worst news about his health is that he has a deformed left hand. He has a very small thumb, a very, very small pinky, and no other fingers. Luckily, he does have all the bones in the hand and he has the first knuckles. They do not think that his hand has anything to do with being pre-mature. Most likely, some of the tissue that builds up in the amniotic fluid got wrapped around his fingers, cutting off circulation and essentially killing the finger growth. Of all the things that could have gone wrong, that is very minor. 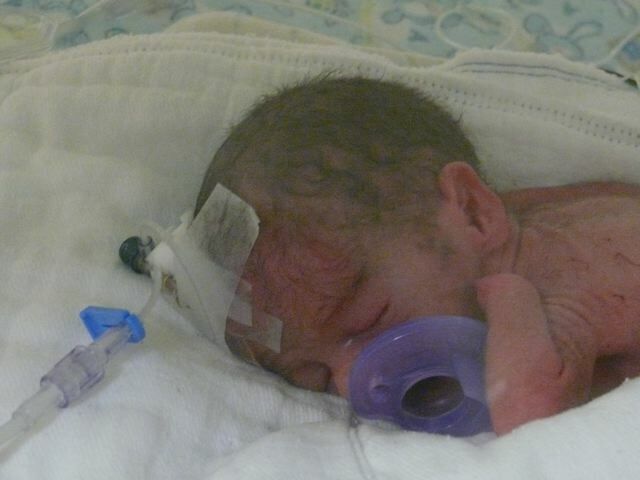 He is really doing great in the NICU, and they have the highest of hopes for him. Anne is doing quite well. She is a bit sore, and is having a hard time moving around on the bed. She is still on magnesium sulfate, which is used to prevent the preeeclampsia from become eclampsia (which consists solely in her having seizures). The mag sulfate is 99% effective is preventing eclampsia. She is also now on BP medication. So far, her BP has been really normal post-surgery. This is really great. Most of the time it does go back up after the surgery drugs wear off. She will probably be discharged in 3-6 days. That is pretty much all of the news. 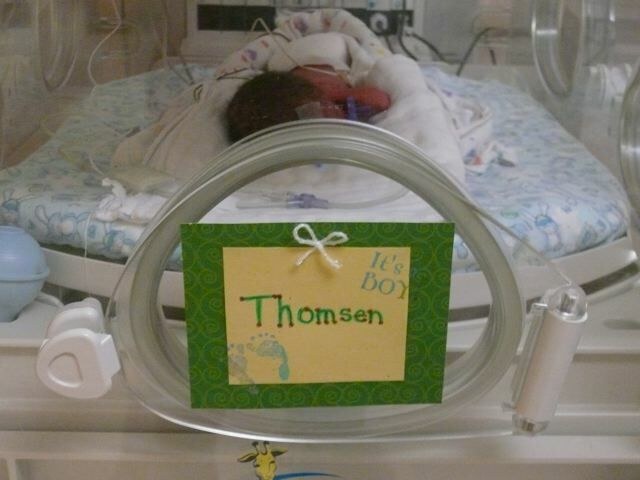 Thom will be in the NICU for a good while. They will focus on getting him bigger and making sure he develops normally. So far, he looks great. I will post pictures of the little guy tomorrow when I get a new USB cable. Errol and I had planned to leave Arizona and begin our drive to Nebraska on June 3o. On June 25, when our story begins, apartment notice had been given, moving truck scheduled, and good-bye party had. We had our monthly pregnancy visit the afternoon of the 25th and were told to come in an hour earlier for the appointment in order for another ultrasound to be taken. Our doctor had left a message on the 16th commenting on the low levels of amniotic fluid during the June 12 ultrasound. This pick-up led to blood tests, fetal monitoring, and an evening appointment at the hospital on Errol’s birthday for a biophysical profile. After the ultrasound, we waited in the clinic lobby for an hour or so for our regular doctor’s appointment. My name was finally called and my weight and blood pressure taken. Apparently, my pressure was high and was taken again once I got in the actual patient room. It was high again and the nurse got another cuff, and I was told to lie down on my left side. My pressure was taken again, and then the doctor came in. She told me that the amniotic fluid was low again this afternoon and my pressures were high. These were two big signs that the baby was not doing well and reasons why the baby was not growing on schedule. She requested that I go straight to the hospital to be monitored for 24 hours. At the beginning of the conversation, she told us to go to the hospital on Osborne (where we went for the BPP on Errol’s birthday), but by the end, she told Errol to take me to the hospital on Shea where the high risk pregnancy doctors were and where they would be equipped to handle the birth of a baby 12 weeks premature. Errol and I arrived at the hospital a little before six, and I was immediately put on a fetal monitor, given an IV, and my pressure was taken at least once every hour. I was also given the first dose of a steroid that helps the baby’s lungs mature quicker than normal. Dr. Moon also ordered a 24 hour urine and the insertion of a foley catheter. Another biophysical profile was taken Monday night. Unfortunately, our little one didn’t do as well as the BPP taken the week before. On June 20, the baby scored an 8/8, and on Monday, the score was a 0/8. At this time, I had a feeling that this visit was going to be more than a 24-hour observation stay. The catheter was removed 36 hours after insertion and the result of the urine test was not enough to lead to a diagnosis. They were looking for a protein level of at least 300 mg–high enough to diagnose me with preelampsia. My protein was only 270 mg. Nonetheless, I had to stay in the hospital and was visited by a number of doctors including the specialist who took care of the tiny preemies when they were born and every doctor in Dr. Moon’s practice. It was not a very good time for us, and I felt a bit neglected and shuffled between doctors not really knowing what had happened earlier. On top of that, we were in the middle of moving when all this began. Poor Errol had to pack up the rest of the house and the truck while I was stuck in the hospital. Thankfully, he received an unbelievable amount of help from his mother and got the truck loaded with Marc and Ryan Maves’ assistance. It was a situation that no one would wish upon anyone else, and I’m so glad that it’s over. Now Errol is able to spend all his time and nights with me here. It’s a bit odd that we don’t have a home anymore in Arizona, and we’re literally living in our hospital room, but I’m counting on this being a very good story in a few years. The next week I was handed over to a perinatologist, and it has been great to have one doctor making the decisions and taking care of me. She ordered another 24 hour urine, and, thankfully, a catheter was not required this time. However, this test revealed my protein levels had jumped to 470 mg. After this, Dr. Francois diagnosed me with preeclampsia, and this is where we remain. Preeclampsia begins with high blood pressure and high protein levels, but it progresses to liver and kidney failure in the mother. For this reason, I have my blood taken every Wednesday and Saturday to test for early signs of this. Once my organs start to fail, the baby will need to be delivered. The good news is that the baby seems to be doing well. It had more than interval growth at last week’s ultrasound and apparently looks great on the monitor. Hopefully, the preeclampsia won’t progress too quickly so the baby can stay inside as long as possible. Today we made it to the 30 week mark. That’s the update for now. I’ll try to do better with the postings.